Forbes recently revealed its annual Celebrity 100 list of the world’s most powerful celebrities, chronicling the earnings and media saturation of entertainers, athletes, and multi-media titans. A few of Nashville’s biggest stars make the cut, led by Taylor Swift at No. 11. Her earnings for the previous 12 months totaled $57 million, and her social media ranking was seventh best overall. Just making the Top 50 at No. 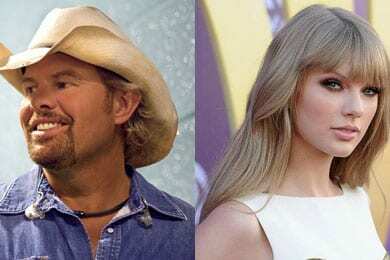 49 is Toby Keith, who earned $55 million between his numerous ventures. Close behind at No. 53 is Kenny Chesney, and Brad Paisley lands at No. 68. Jennifer Lopez is at the top of the list, with earnings over $52 million and a near constant media presence. The American Idol judge has parlayed her presence on that show into hit singles and endorsements from L’Oreal and Gillette as well as a clothing line at Kohl’s. She bests last year’s No. 1 Lady Gaga, who slips to fifth place overall. In the No. 2 slot is Oprah Winfrey, whose presence was actually somewhat diminished following the end of her syndicated television run.